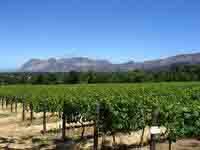 Constantia is the origin of wine production in South Africa, and one of Cape Town's most exclusive suburbs. The Constantia wine route is the oldest yet smallest wine route in the Cape, consisting of just five wine farms that concentrate on producing a few wines of international quality and repute. The historic Cape Dutch homestead at Groot Constantia is one of the oldest wine estates in South Africa, home to the first governor of the Cape, Simon van der Stel, and the valley's most famous wine farm. The house itself is furnished with items from the period while an adjacent wine museum exhibits drinking and storage vessels in glass, silver, copper, and stoneware dating from 500 BC to the 19th century. There are some great restaurants at Groot Constantia as well as tasting rooms and visitors are welcome to wander around the beautiful estate. The other four wine estates that are generally known to constitute the Constantia wine route are Klein Constantia, Steenberg, Buitenverwachting and Constantia Uitsig, all of which include highly acclaimed restaurants. Those who want to extend their route further can also explore Beau Constantia, Constantia Glen, Eagles' Nest and Silvermist Wine Estate. Meandering from one estate to another in Constantia is a glorious way to spend a day, complete with history, natural beauty, great food, and, of course, superb wine.